All transactions are safe and secure with a reliable history in online purchasing behind each of our associates. Buy the Striped Moishe t-shirt to own Where the Wild Things Are clothing and merchandise. These white Where the Wild Things Are t-shirts by Junk Food are nice additions to any movie clothing collection. Whether you are young or old, this book has a place in your life. Moishe, Tzippy, Bernard and all the wild things put you to sleep as a child and will do the same for your children. Don't forget to grab some other Maurice Sendak books for bedtime stories like Pierre: A Cautionary Tale or Higglety Pigglety Pop! : Or There Must Be More to Life. 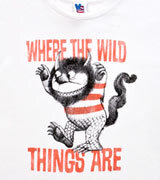 In addition to the Striped Moishe tee above, browse the Where the Wild Things Are Clothing Gallery for more apparel like men's and women's clothes, kids shirts or hoodies.